Stoughton sophomore pitcher Nicole Baker is poised for a big year in the circle for the Black Knights, stepping in to fill the shoes of graduated pitcher Gina Carafa and taking over as the ace this spring. Baker saw some league action as a freshman and head coach Deb Parker said that she has put in the work in the off-season to be a leader for the team, which was demonstrated in the season-opening win against Oliver Ames. She allowed only four hits and struck out eight while picking up the complete game victory. Baker also went 5-for-5 at the plate with a double, a grand slam, and six RBI. It was an impressive debut to the new season and a boost to the Black Knights, who will be hoping for a return to the postseason in 2019. Although 2018 wasn’t the best spring for the Hornets, who missed the playoffs, senior centerfielder Mady Bendanillo remains one of the league’s most dynamic players, both in the field and at the plate. Her speed and athleticism allow her to cover the gaps in the outfield, chasing down hits that others might not get to, but also makes her a threat for extra bases any time she is at the plate. In the middle of an experienced lineup, Bendanillo gives Mansfield a run-producing threat who can also make plays and put pressure on the defense with her legs. She started 2019 well with a pair of hits and her first home run in Mansfield’s win over Foxboro and she will be counted on to get the Hornets back in the hunt for the postseason. Attleboro senior McKenzie Bergdoll started her career with the Bombardiers as a freshman pitcher and she may see some time in the circle this spring, but in the past three seasons, she has turned into one of the league’s top power hitters. Bergdoll led the league in hitting last season, batting .522 and was third overall in total hits with 36. She was also tied for the league lead with seven homers, including some mammoth shots that cleared the fence at the Attleboro High field, which takes considerable pop. Tall and with a pure swing, the LeMoyne College-commit is a threat to knock one out of the park every at-bat, as she showed in Attleboro’s season-opening win against Canton with three hits and her first homer of the spring. With Bergdoll in the middle of the lineup, the Bombardiers will be eyeing another playoff berth this season. Taunton senior third baseman Jaime Brown, the 2017 HockomockSports.com Underclassman of the Year, is a five-year starter for the Tigers and has been one of the most consistent hitters in the league for every one of those seasons. Last year, Brown set the table for the Div. 1 state champions, batting .500 in the lead-off spot with 38 hits and 19 RBI. She also drew 19 walks to put runners on base for the heart of that potent Taunton lineup. When she was needed in clutch situations, Brown also came through with big hits, like a bases-clearing triple in the state semifinal against Newton North. She was also a strong fielder, including the final play of the state final against Wachusett. With quick hands, quick feet, and a tremendous eye at the plate, Brown is one of the toughest outs in the league and she will be one of the reasons that Taunton has its sights set on repeating in D1. North Attleboro junior pitcher Bella Erti has been dominant in the circle for the past two seasons, leading North into the playoffs each spring, including a surprising run to the 2017 D1 South semifinal as a freshman. Last year, Erti went 15-5 and posted an ERA of 1.58, helping North finish second in the Davenport division. The hardest-throwing pitcher in the league last season, Erti struck out 137 batters and was able to keep the Rocketeers in just about every game. A tough loss to Braintree in the playoffs has the Rocketeers focused on putting together a deeper run this season and with Erti in the circle for the bulk of the innings, North knows that it has a pitcher who gives it a good shot at the program’s first league title since 1990. Erti is also a threat at the plate, batting .357 last spring with three homers. Expectations are as high as ever for North this season and much will rest on Erti’s right arm. 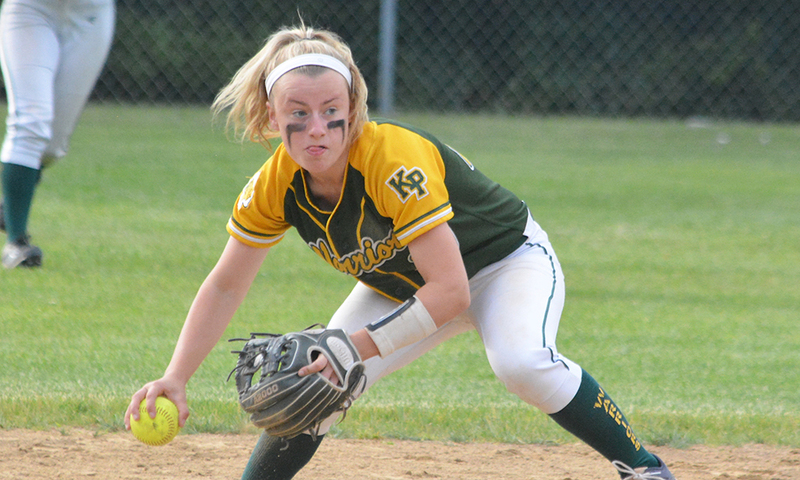 Shortstop has been a position of strength for the Warriors for quite a while and senior Meghan Gorman has been one of King Philip’s best at that position over her three years on varsity. The Central Connecticut State-commit is one of the best defensive shortstops in the state, rarely going through a game in which her jersey doesn’t get dirty from diving after a ball and with a very strong arm. She is also one of the top hitters on KP, batting .493 with 36 hits, 34 RBI, and 33 runs scored. She hit 12 doubles and stole 11 stolen bases. All of those were team highs. Last spring, Gorman recorded the 100th hit of her career while helping the Warriors win another league title, the program’s 11th in the past 12 seasons, and advance to the D1 South final against Taunton. KP always expects to be in the mix for the Kelley-Rex title and this season is no different, especially with Gorman leading the way at short and at the top of the lineup. Canton junior Caroline Hughes has been part of an upswing for the Bulldogs in the past two seasons, helping them jump from one win as a freshman to eight wins last spring and now under new coach Dave Bohane there is hope for even more in 2019. Hughes has played a major role in last year’s success as the team’s ace. She pitched almost every inning last year, helping Canton win twice as many games last spring as in the two previous seasons combined. Her development as a big-game pitcher will be a key to the Bulldogs making a run back at the state tournament in what is a very wide-open Davenport division and using the experience of last season (which ended in a loss to perennial power Dighton-Rehoboth) to maybe push a little further in the playoffs. Franklin senior Ally Shea has been a consistent presence in the Panthers lineup since jumping in midway through her freshman season. The lefty batted .344 last season, which was down slightly from an even more prolific sophomore campaign, and finished with 22 hits. Shea has the power to find the gaps and rack up extra bases and defies expectations by being a hitter that likes to take the ball the other way. She loves to hit it through the hole between second and short and use the gap in left-center. The key for the Panthers will be getting more players on base ahead of her to get her up in more run-producing situations and with a strong core returning Franklin will see an opportunity for a return to the playoffs this spring. Shea is also a versatile player who can play catcher, first base and a little outfield when called upon, which makes her a mainstay in the Franklin lineup and allows flexibility for changes as the game goes along. Foxboro sophomore shortstop Morgan Sylvestre made an instant impact as a freshman, stepping right into the Warriors lineup and helping them not only make the postseason but win a pair of playoff games, reaching the D2 South quarterfinal. Sylvestre batted .419 with 26 hits as a rookie, driving in 16 runs for Foxboro. She also played a strong shortstop, showing consistency in the field and jumping into a leadership role on the left side of the infield, which will be important this season as well. Sylvestre’s continued development as a hitter will allow the Warriors to make up for some of the production lost to the graduation of Hannah Davis, while her play in the field will give confidence to senior pitcher Emma Rohan. As the Warriors make another playoff push, Sylvestre will be right in the heart of everything they’re doing. Taunton sophomore pitcher Kelsey White steps back into the circle this spring after pitching every inning of the Tigers’ run to the Div. 1 state championship. White showed no indication that she was a freshman last season, displaying the composure of a veteran as she worked her way through some of the toughest lineups in the state. She finished with a record of 16-2 and an ERA of just 1.18. She struck out 114 batters in 119 innings, walking only nine. This year, White will have a new battery mate, after the graduation of Kya Enos, but her demeanor gives little indication that will be a problem. White is also a menace at the plate, batting .418 and driving in 24 runs while only striking out seven times in 79 at-bats. Taunton has hopes of repeating as champion and White is a major reason why the Tigers enter the season with confidence. Canton, 6 @ Attleboro, 10 – Final – Attleboro rallied from a 6-0 deficit to earn a win in its opening game of the season. The Bombardiers pushed across five runs in the third and three more in the fourth to take the lead. McKenzie Bergdoll went 3-for-4 with a two run home run (in the sixth) and three RBI total. MacKenzie Killough also went 3-for-4 with a pair of doubles and two RBI. Emily Gittle earned the win in the circle, coming on in relief. She struck out eight in four innings of work. Canton’s Liz Bickett went 2-for-4 with a double and a triple. Mansfield, 16 @ Stoughton, 3 – Final – Mansfield raced out to a 9-1 lead after the first quarter and never looked back. Mike Reed had a team-high four goals and added three assists, Connor Quirk scored three goals and had four assists, and Aidan Sacco (two goals), Jake DiSangro (goal, assist) and Xander Holmes (two assists) each had multi-point games for the Hornets. Attleboro, 11 @ Norton, 10 – Final – Attleboro raced out to an 8-3 lead at halftime and then held on after a comeback attempt by the hosts. Kyra Lyons led the offense with five goals, Rylee Fontes added four goals while Sydney DiLiddo, and Holly Kailher each scored once. Maggie Porreca made six saves for the win in net while Attleboro head coach Chrissy Quinn said Sam Fasoldt was excellent on defense for the Bombardiers. Franklin, 10 vs. Westwood, 14 – Final – Franklin held an 8-5 lead at halftime but a strong second half from the Wolverines gave Westwood the win. Westwood knotted the score 10-10 with just over 10 minutes left. After taking the lead, Franklin pulled the goalie to try and tie the game but the Wolverines cashed in for some empty net goals. Erin Walsh had four goals and two assists to pace Franklin’s offense while Stella Regan scored twice and had one assist. Freshman Kate O’Rourke had a strong game in the midfield with nine draw controls. After back-to-back playoff appearances, the expectations are high around the Attleboro program this spring. The Bombardiers return eight of nine starters from last year’s team and the lineup should be loaded with good hitters, as well as multiple players who can step into the circle and produce a good start. With the depth on the roster this season, Attleboro will be eyeing another postseason berth. Senior McKenzie Bergdoll is one of the top power hitters in the league and will be back for another spring in the heart of the Attleboro lineup. She will be joined by classmates Jordyn Lako and Kayla Battisti as starters. Junior Makenzie Killough will be back at shortstop and also batting cleanup and providing protection for Bergdoll in the order. Sophomore Lora Woyton returns behind the plate, sophomore Autumn O’Connell will be in center and batting second and junior Ashley Macia will be out in left. Sophomore Brenna Morse will be taking over in rightfield. In the circle, Attleboro has plenty of depth with juniors Emily and Jenna Gittle and Bergdoll all able to step in. The Bombardiers will try to take advantage of their overall team speed and head coach Mark Homer said there are a few freshmen who may see playing time right away. Canton had quite the turnaround in 2018 under second-year head coach Jennifer Robillard, winning eight games, seven more than in 2017, and making a return to the state tournament. Robillard, last season’s HockomockSports.com Coach of the Year, has moved on to a position at Bentley and football coach Dave Bohane has taken over a team that has seen an influx of young talent and has momentum on its side heading into the spring. Junior pitcher Caroline Hughes is one of the reasons for optimism in the program, as she is looking to build off a strong sophomore season in which she pitched almost every inning. Hughes was also one of the team’s top hitters and she will be at the heart of the lineup along with sophomore outfielder Liz Bickett, who batted .409 last season. Bickett is just one of several sophomores who the Bulldogs will be counting on, including infielders Olivia Lanci and Sarah Kelly, catchers Steph Trendell and Amanda Vrabel. Junior catcher Jackie Howard and seniors Haley Donovan and Ally Chin will provide leadership for this young group to try and get the Bulldogs right back into the state tournament mix. “I am very excited to be coaching this team,” said Bohane, who has previously served the program as an assistant coach. “They are extremely hard working and devoted to the program. I think they will set the standard for our future players who come through the program. It’s a very tough league, but we will take it one game at a time and try to improve each game”. Foxboro made a run in the Div. 2 tournament last season, winning a pair of games before being knocked out in the quarterfinals, and the Warriors will hope to build on that exciting finish to 2018 by making a run at the Davenport crown this spring. Even with the loss of catcher Hannah Davis, who was instrumental in the team’s playoff run, Foxboro has a strong returning core and some talented young players stepping in to give head coach Mark Maguire confidence ahead of the new season. Senior Emma Rohan will be back in the circle for her fourth year as the Foxboro starter and she has the experience of pitching in a number of big games and against the top teams in the league. Senior Cam Willis will play first this season, but can also step in and pitch if needed along with junior Amelia Stowell. The pitchers will have a rookie to throw to, as freshman Allie Willis will be stepping in behind the plate. Sophomore Morgan Sylvestre returns at shortstop after a strong first season on varsity and will be one of the leaders of the infield. Senior Chelsea Gibbons is at third base and freshman Peyton Feldman takes over at second. Sophomore Nicole Theriault will be in centerfield but can play a number of positions, senior Riley Martignetti gives the team pop from the right side of the plate, and senior Jill Finn can play all three outfield positions. Franklin has consistently been right behind perennial league leaders Taunton and King Philip in the Kelley-Rex division standings but has narrowly missed out on the playoffs by a single win in each of the past two seasons. This year, the Panthers have eight seniors coming back with the goal of getting the team back into the postseason and use a typically tough schedule to prep for a tournament run. Pitching will be a strength for the Panthers this year with seniors Jackie Cherry and Emily Valentino giving the team depth and different options in the circle. Throwing strikes will be the key for both and limiting opposition base runners. Behind the plate, Franklin has plenty of experience as well with seniors Ally Shea and Maggie Hobby both capable of stepping in and handling the pitchers as well as providing power at the plate. Senior Tara Hartnett will be back at shortstop and provides strong defense up the middle. Junior Anna Balkus will be in centerfield and will set the table for the offense as the lead-off hitter. Junior Maddy White will be at third base and joins Shea and senior Kylie-Jade Bouzan as the team’s primary run producers. Every season King Philip loses important players and every season the Warriors seem to be right back in the mix for the league title. This spring should be no different. KP will have several important players to replace in the lineup, but it expects to challenge for a 12th title in the past 13 seasons and also make another tournament run, following last year’s South final loss to Kelley-Rex rival Taunton. Meghan Gorman is the player to watch for the Warriors this season, as the senior shortstop is one of the top defensive players in the state and also the spark plug at the top of the lineup. Senior Faith Turinese will move from the outfield into the circle and will split time with classmate Heather Nix as the top pitchers for the Warriors. Turinese also batted over .400 last year and will be an important bat in the middle of the order. Junior Destiny Goyco will step in behind the plate, after overcoming an injury from basketball season, and fellow junior Liliana Rolfe will take over at third. Grace Kelley will be at second base and Anna Bradley will be at first. The outfield will be filled with speed, including Kara McWhinnie in left, sophomore Paige Berdos in center, and either Ryan Stagg or junior Reaegan Simeone in right. Mansfield is looking to bounce back from a tough 2018 season in which the Hornets struggled in the Hockomock (going 4-12 in league play) and missed the playoffs. This year, Mansfield hopes for a quick turnaround and return to the state tournament with an experienced roster that brings back 11 players, seven starters, and seven seniors from last season. The battery of senior pitcher Sarah Cahill and senior catcher Caty DeMassi is back and should give the Hornets a good foundation on which to build on this season. Seniors Megan Letendre and Kara Bendanillo will hold down the left side of the infield and provide pop in the middle of the lineup, while Mady Bendanillo returns in centerfield to give Mansfield a dynamic defensive player and another strong bat. There is an influx of youth as well with two sophomores and a freshman jumping into varsity and having the chance to contribute right away. “Our goal is to make it back to the tournament this year and with strong leadership from our captains and our seniors, I think we will have a good shot at it!” said Mansfield coach Lori Letendre. The biggest question for Milford is how do the Hawks move on from a group of 10 seniors that won a combined 79 games, four league titles, and the 2017 state championship? Milford has been the team to beat in the Davenport division for six years and a relatively inexperienced group will have to face a season in which the target for every team in the league is squarely on their backs. Junior Megan Hart is one of the primary options to replace Kelley Reichert in the circle to start the season, with freshman Olivia Morelli showing potential to step in and contribute innings right away. Senior Lucy Creedon can step in at first or in the outfield. Junior April Swain will jump into the outfield along with classmate Taylor Waldrup, while junior Amanda Wenckus can play either position on the left side of the infield and sophomore Carly Ferreira can play either corner infield spot. Sophomore Elise Fauerbach can play behind the plate or in the outfield, while her classmate Natalie Casilli will take an outfield spot. There are a lot of spots to fill this year, but head coach Steve DiVitto is talking about that as an opportunity for a new group of players to step into. Two seasons ago, North Attleboro was a young team that made a surprise trip to the South semifinal, but this year the Rocketeers will have much higher expectations. North is now the experienced team in the Davenport division and has aspirations of unseating Milford and winning a first league title since 1990 and adding to the league’s recent history of strong tournament performances with another deep run. Junior pitcher Bella Erti will be one of the league’s top pitchers again this season, after a 15-5 sophomore season in which she struck out 137 batters. She also hit .357. Junior Ashley Cangiano is also back for her third year as a starter and is one of the top catchers in the league. Abby Gallagher returns to the North outfield after hitting .500 last season as a sophomore and senior Olivia Capobianco will be back in centerfield and the middle of the North lineup. Freshman Mandi Hanewich and sophomores Emma Bailey and Belle Clarkin will compete for the third outfield spot after impressive preseasons. Senior Katie Daby is at first, while sophomore Emily Nardelli moves from shortstop to second base. Junior Alex Moulson takes over at short and her classmate Annabelle Hebard will be at third. Emily Bedard and Mackenzie Nardelli add to North’s infield depth and Alivia Byrne will give Erti a rest in the circle and is another big bat in the lineup. Last season was a struggle for the Tigers, with only three wins and head coach Lindsey Allison is hoping that a group of younger players can add to the returning core and make a push to get Oliver Ames back into the state tournament. Allison is confident that the offense will get into the swing of things for the Tigers after scoring only 66 runs last season, second-lowest in the league. Senior Kayla Georgeu will be back in the circle for OA and in the heart of the lineup. The Tigers will count on sophomore Emma Varella to provide some innings at pitcher, as well as playing in the infield. Senior first baseman Katie Mills is a big bat for the Tigers and junior Katie Abreu can step in at either shortstop or centerfield depending on the game to provide vocal leadership. Sophomore Grace Simone will be behind the plate this season. It was definitely a rough debut season for Sharon coach Heather Poliferno, but it was also a chance for a number of young players to get experience at the varsity level. This spring, there is renewed enthusiasm with a crop of underclassmen joining the experienced players to give Poliferno and the Eagles confidence for a much better spring. Freshman Trinity Payne is the player to watch for the Eagles this season as she takes over as the starting pitcher and has already drawn the attention of coaches in the Davenport division. She will be used at a couple of different positions and gives the Eagles versatility in the lineup. Senior Alli Small will be back at shortstop this season, while classmate Jody Goldenberg is back at first, and senior Rebecca Clayman will be the leader of the outfield group. As the program is growing, Sharon is hoping for much different results this season. Stoughton struggled to find a groove in 2018 and ended up missing the playoffs under first-year head coach Deb Parker, who had made the switch from Sharon before last season. This year, the Black Knights bring back starters in key positions and once again have the potential to make a run at a state tournament berth and even challenge for the Davenport title. Seniors Nikki Coppola (second base) and Jordan Lyons (shortstop) give Stoughton a strong combination up the middle and senior Karly Estremera brings plenty of experience at third base. Sophomore pitcher Nicole Baker will take over full-time in the circle this season and Parker is impressed by the work that she put in during the off-season to get ready. Baker will be throwing to an experienced catcher, as senior Brianna Ferrandiz is back behind the plate for the Black Knights. Junior Lexi Baptista will lead the outfield crew in center and could also be one of Stoughton’s top hitters this season. Freshmen Melody Casna and Sydney Menz will give the Black Knights versatility by playing multiple positions. How do you follow up a state championship? For Taunton, it just may be to make a run at a repeat. The Tigers lost the second, third, and fourth hitters in the lineup (including league MVP and HockomockSports.com Player of the Year Kya Enos), who combined for 88 RBI, but there is a ton of talent coming back from last season, all of whom contributed at one point or another during Taunton’s run to the title. It starts in the circle where sophomore Kelsey White will be the starter again this season after going 16-2 as a freshman and pitching every inning during the playoff run (not to mention batting .418). Her sister Alexa will also see time at pitcher, along with freshman Olyvia Mendonca, but will also play most of the season in centerfield. The infield will be a strength for the Tigers, with all four players back. Senior Jaime Brown (batted .469) is back for her fifth year at third base and is one of the top hitters in the league, sophomore Hanna Aldrich (.385 average with four homers and 30 RBI) is in her third year at shortstop and was this site’s Underclassman of the Year in 2018, sophomore McKenzie McAloon returns at second base for her third season, and junior Paige Silvia is back at first. Silvia and junior Riley Murphy are also in the running to replace Enos behind the plate, while junior Abbie McDonough takes over in left and eighth-grader Ava Venturelli could start the season in right. Below are the official 2018 Hockomock League Softball All Stars, selected by the coaches in the league. King Philip, 2 @ Attleboro, 5 – Final – Ryan Morry threw a complete game, allowing only five hits and one earned run, in his first varsity start. Mason Houle went 3-for-4 with a pair of RBI to spark the Bombardiers offense. Sharon, 3 @ Foxboro, 2 – Final – Foxboro’s Steve McLaughlin had a strong outing, allowing just three hits over six innings of work and no earned runs. He struck out seven in the Warriors’ loss. North Attleboro, 11 @ Canton, 5 – Final – Canton held a 2-1 lead after an inning of play but North Attleboro’s offense proved to be too much. The Rocketeers tied and then took the lead with four runs in the fourth inning and never looked back. Nate Pearce’s sacrifice fly scored Nick Sinacola to tie it and Nick Raneri had a two-run single to plate Jeff Gale and Zach DeMattio (two hits, RBI) to take the lead. Raneri (four RBI) went on to add another two-out two-RBI single in the sixth inning and the Rocketeers tacked on three runs in the seventh inning for insurance. Brendan McHugh was on base five times (hit, four walks), scored twice and had an RBI. Sinacola got the win on the mound, striking out six in six innings of work, retiring the side in the third, fourth, and fifth innings. Oliver Ames, 1 @ Franklin, 10 – Final – Click here for a recap of this game. Mansfield, 7 @ Taunton, 2 – Final – Click here for a recap and photo gallery of this game. Milford, 4 @ Stoughton, 5 – Final – Stoughton senior Ruben Gonzalez put his speed to good use for the Black Knights, stealing third and then coming home for the winning run on an errant throw to help the Black Knights walk off with a win. 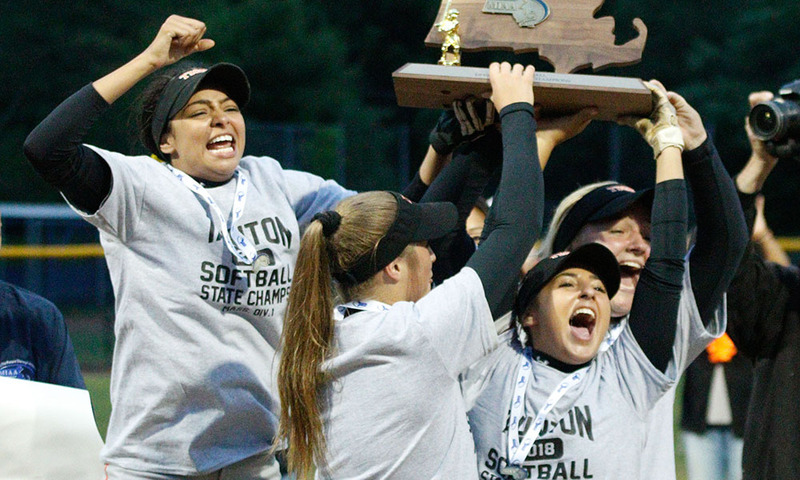 Gonzalez had two hits, three runs, and three stolen bases to pace Stoughton. He also earned the win on the mound, throwing 0.2 innings with a strikeout. Robbie Seaman went 2-for-2, including a double, with two runs and a stolen base, Mike Nazzaro had two hits and two RBI, and Matt Hadley chipped in with an RBI double for the Black Knights. Milford’s Danny Corsini tossed six innings, allowing just three earned runs. Attleboro, 1 @ King Philip, 9 – Final – The game was tied at 1-1 in the fourth, but the Warriors broke the game wide open with an eight-run inning. Faith Turinese singled to start that rally and then also hit a two-run homer in the same inning. Jess Bonner also had a pair of hits, including a homer, and Brooke Taute and Nicole Carter had a pair of hits apiece for the Warriors. Elise Pereira allowed only one hit in four innings of work, which was a home run off the bat of Attleboro’s McKenzie Bergdoll. Turinese pitched the final three innings and allowed only two hits and no runs. Canton, 0 @ North Attleboro, 12 – Final (6 Inn.) – The Rocketeers bounced back from a tough loss to King Philip with a shutout of the Bulldogs. Bella Erti struck out 12 and allowed only three hits to earn the win. Olivia Capobianco scored a pair of runs, while Emily Nardelli, Annabelle Hebard, and Andrea Miceli each had two hits for North. Kasey Papineau, Gina Manganaro, and Jaclyn Buckley each had one hit in the win. Foxboro, 11 @ Sharon, 1 – Final – Alli Small scored the lone run of the game for the Eagles. Franklin, 14 @ Oliver Ames, 2 – Final (5 inn.) – Franklin scored five runs in the first inning to set the tone and tacked on at least a run in each of the next four innings to beat OA. Maddie White went 4-for-4 at the play, including a three-run home run for the Panthers. Ally Shea went 3-for-4, Anna Balkus added two hits, two runs, and an RBI, and Tara Hartnett chipped in with two hits and three RBI. Molly Collins scored three runs as a courtesy runner for Franklin. Caroline Mahoney went 2-for-3 and scored a run in the loss. Kayla Georgeu was 1-for-2 with an RBI-double and Lexie Campbell scored OA’s other run. Taunton, 7 @ Mansfield, 1 – Final – Jaylin Couto earned her fourth win of the season with a complete game, striking out eight. Jaime Brown was 2-for-4 for the Tigers with three runs scored and one RBI. Taunton also got a pair of hits from McKenzie McAloon and Payton Ceglarski and one hit and two RBI from Kya Enos. The Hornets had seven hits as a team and had base runners in all but the first inning, but couldn’t find the big hit with runners on base. Sydney Woods and Mady Bendanillo each went 2-for-3 and Caty DeMassi, Ella Verheggen, and Mary Muldoon each had one hit for Mansfield. Stoughton, 0 @ Milford, 12 – Final (5 Inn.) – Kate Irwin slapped three hits, including the 100th of her career, and scored two runs to help the Hawks beat visiting Stoughton. Emily Piergustavo (three RBI, run), Emily Hartman (triple, three RBI), Jess Tomaso (two runs), Shannon Cormier (run) and Kelley Reichert (two RBI) each had a pair of hits for Milford. Reichert earned the win in the circle, striking out six while allowing just two hits. Oliver Ames, 19 @ Bellingham, 8 – Final – Eric LeBlanc scored a pair of goals and recorded an assist to become the program’s all-time leading scorer, as the Tigers clinched just their second tournament berth in the last 10 years. Shane Kilkelly, Sandro Masciarelli, and Owen Gallagher each scored four goals apiece for OA. Canton, 6 @ Sharon, 12 – Final – Bridget McManus was commanding in the Sharon defense with two forced turnovers and six ground balls, helping the Eagles sweep the season series with the Bulldogs. Emma Eberhardt sparked the attack with five goals and five assists, while Sabrina Robbins had a hat trick and a pair of assists. Abbi Solomon had two goals and two assists, Jenna Goldstein had two goals, and Maeve Barbera had one assist for the Eagles. Franklin, 18 @ North Attleboro, 5 – Final – Franklin sophomore Erin Walsh recorded six points and classmate Kelsey MacCallum added five points as the Panthers picked up a big win on the road. Walsh had five goals and one assist while MacCallum scored three times and had two helpers. Alex Field played well defensively for the Panthers with three ground balls and two caused turnovers while sophomore Gianna Cameron made eight saves in net. Kayla Moulin made 10 saves for North and head coach Colleen Carchedi said that the defense played “awesome” but that the Rocketeers couldn’t get the attack going. Carchedi said that Katie Lindstrom had a great game. Mansfield, 6 @ King Philip, 18 – Final – The Warriors had seven different goal scorers and held the Hornets without a goal in the second half to stay ahead of Mansfield in the battle for second in the Kelley-Rex division. Caroline Klim led the way with five goals and two assists and Dana Truini added four goals and an assist. KP also got three goals and an assist from Jess Sullivan, two goals apiece from Alli Meehan and Olivia Tormey, and one goal apiece from Jenna Hitchen and Ali Wilson. Oliver Ames, 16 vs. Bellingham, 5 – Final – Oliver Ames had eight different players find the back of the net in a win at home over Bellingham. Ella Hogan scored four goals while Olivia Piazza registered three and added one assist. Alex O’Connor, Sam Cathie, and Sarah Stevens each netted a pair of goals while Kayla Lozzi, Sofia Masciarelli, and Emalyn Duvall rounded out the scoring with one goal apiece. Attleboro, 0 @ King Philip, 5 – Final – King Philip lost just one game in all five matches to beat visiting Attleboro. Marco DiStefano (first singles), Nick Putney (second singles), the team of Sean Desrochers and Nate Ihley (first doubles), and Aidan Ignatius and Nick Ihley (second doubles) all won 6-0, 6-0. KP’s Jack Cannon won 6-1, 6-0 at second singles. Canton, 0 @ North Attleboro, 5 – Final – North Attleboro’s singles players didn’t lose a game in any of the three matches in a win over Canton. Richard Bermudez, Christian Bermudez, and Jonah Manso swept singles play, 6-0, 6-0, each. The team of Ben Pfeffer and Vikram Senthilakumaran won 6-1, 6-0 at first doubles while Alex Rinaldi and Alex Pfeffer prevailed 6-0, 6-1 at second doubles. Foxboro, 0 @ Sharon, 5 – Final – Sharon completed a sweep of visiting Foxboro, winning both doubles matches in straight sets. Andre Olivei won 6-0, 6-4 at first singles, Danujan Thirumavalavan won 6-1, 6-2 at second singles, and Ashwin Sreevetsa won 6-2, 2-6, 6-4 at third singles for the Eagles. Max Brody and Russell Rapaport won 6-3, 6-4 at first doubles and Arie Chinnappan and Alex Aspel picked up a 6-4, 6-3 win at second doubles. Franklin, 5 @ Oliver Ames, 0 – Final – Franklin lost only two games total in the five patches to notch a win on the road. Rohan Herur won 6-2, 6-0 at first singles for the Panthers. Franklin’s Tyler DiPalma (second singles), Tyler DiPalma (third singles), the team of Tony Calderone and Derek Wu (first doubles) and the team of Saketh Saripalli and Shourmik Sompally (second doubles) all won 6-0, 6-0. Taunton, 2 @ Mansfield, 3 – Final – Mansfield grabbed one win in singles play and swept doubles play to edge Taunton. Luke Nickerson won 6-4, 6-3 at first singles, the team of Jalaj Singh and Sethu won 6-1, 6-2 at first singles, and Danny Radev and Ben Selden won 6-2, 6-0 at second doubles. Taunton’s Brett Beaulieu won 6-0, 6-0 at second doubles and Mike Briggs notched a 6-4, 6-1 win at third singles. Stoughton, 4 @ Milford, 1 – Final – Stoughton picked up a pair of wins in both singles and doubles play to get a victory on the road. Freshman Waseem Sablon won 6-0, 6-1 at first singles and junior Erik Anderson won 6-4, 6-0 at second singles. North Attleboro, 3 @ Canton, 2 – Final – North Attleboro recorded two wins in singles play and one more in doubles to edge Canton. Senior Jordan Willis won 6-2, 6-1 at first singles and Azka Siddiq earned a 6-4, 6-1 win at third singles. North earned its third point from Tara Nair and Leah Marceau won 6-4, 6-2 win at second doubles. Canton’s Rachel Kupferman won 6-0, 6-0 at second singles and the team of Caitlin Matthews and Stelina Michaelidis earned a 5-7, 6-4, 7-5 (10-8) win at first doubles. Sharon, 4 @ Foxboro, 1 – Final – Nupur Shukla (6-2, 6-4) and Lulu Yuan (6-0, 6-0) both won their singles matches for the Eagles and the doubles teams of Katie Wen and Katie Merport (6-1, 6-0) and Rithika Neti and Sophia Fein (6-0, 6-1) also earned victories for Sharon. Oliver Ames, 5 @ Franklin, 0 – Final – Sarah Leger won at first singles without losing a game (6-0, 6-0) to get OA started on the road. Tate Hadges (6-3, 6-1) won in straight sets at second singles, as did Maura Kiernan (6-1, 6-2) at third singles. Kristin Bloumbas and Emily Yu won 6-2, 6-0 at first doubles and Kathryn McCarthy made her varsity debut at second doubles with Rachel Stryke and pulled out a 6-1, 7-5 victory. Taunton, 3 vs. Brockton, 0 – Final – Taunton’s Ricardo DaFonseca had 36 assists, including the 1,000th of his career, to help set the Tigers up for a win over Brockton. North Attleboro, 6 @ Attleboro, 2 – Final – North Attleboro scored all six of its runs in the top of the third inning to extend its unbeaten start to the season. Nick Sinacola started things with a walk, Jeff Gale reached on an infield single and Zach DeMattio walked to load the bases. Both Sinacola and Gale scored on an error and then Brendan McHugh knocked in Nate Pearce (2-for-3). Both Pearce and McHugh came around to score on a single from Nick Raneri (3-for-4), who crossed home for the sixth run on an error. Attleboro plated its two runs on three hits in the bottom of the third. Sinacola earned the win on the mound, striking out seven with three walks and three hits allowed. Attleboro sophomore Ryan Morry was strong in relief, allowing just two hits in 4.2 innings of work with no runs allowed. Canton, 1 @ Franklin, 4 – Final – Jake Noviello allowed just one run in six innings of work, struck out six, walked four, and scattered four hits to lead the Panthers to a win on the road. Bryan Woelfel earned the win, pitching a scoreless seventh inning. Cooper Ross paced the offense, going 2-for-2 and scoring a pair of runs while Jack Nally had two RBI and Scott Elliott chipped in with a double and a run scored. Sharon, 1 @ Mansfield, 9 – Final – Hockomock League leading hitter Dan Saraceno continued his stellar start to the season, going 2-for-2 with two RBI and a run scored to help the Hornets pick up a big win on the road. After Sharon took a 1-0 lead in the top of the second, Mansfield plated four runs in the third, two more in the fourth and three in the fifth inning. Seniors Tyler Dalton (1-for-2, run) and Cullin Anastasia, juniors Mike Hargadon (2-for-2, two runs) and Sam Nugent (two runs), and sophomore Chris Jenkins (1-for-3, run) each knocked in a run for Mansfield. Sharon’s Drew Naisuler went 3-for-3 and scored on an RBI single from Max Tarlin. Mansfield sophomore John Carney earned the win in his first career start, striking out six with just one walk in five innings of work. He allowed just four hits and one unearned run. Milford, 1 @ Oliver Ames, 16 – Final (5 inn.) – Oliver Ames pushed across six runs in the first inning and never looked back in a big win over the Hawks. Milford took the lead in the top of the first but OA’s bats came to life in the bottom half. Chris Pearsons went 4-for-4 with two RBI, Matt Muir was 4-for-4 with an RBI, and Nick Bloumbas went 3-for-4 with an RBI for OA. Michael Mulrean earned the win, allowing one walk and one hit in five innings of work, striking out six. Attleboro, 3 @ North Attleboro, 4 – Final (8 Inn.) – Annabelle Hebard led off the eighth inning with a double and scored the game-winning run (her third run scored in the game) on a ball hit by Katie Daby, who also drove in a run with a second inning triple. Emily Nardelli drove in a run for North with a double in the fourth and Abby Gallagher and Olivia Capobianco each recorded two hits for the Rocketeers. Bella Erti went the distance to pick up the win and struck out 10. McKenzie Bergdoll and Makenzie Killough each hit homers for the Bombardiers. Milford, 12 @ Oliver Ames, 0 – Final (5 inn.) – Milford’s Kelley Reichert was nearly perfect, allowing just one hit in the top of the fifth to earn the win in the circle. Reichert took the perfect game into the fifth but a leadoff single from Katie Mills broke it up. Reichert struck out five and helped her cause at the plate by going 2-for-3 with a two-run home run and a double. Emily Hartman added three hits, including a double, and an RBI, Emily Piergustavo had two RBI, including a solo home run, Maddy Bonvino went 2-for-2 with a double, Shannon Cormier added two hits and two RBI and Kate Irwin (three stolen bases) also had an RBI. King Philip, 13 @ Sharon, 0 – Final – King Philip set the tone early, scoring nine runs in the first inning on its way to a big win on the road at Sharon. Marjorie Guerrier, Lillianna Rolfe, Nicole Carter, Allie Kuchy, Destiny Goyco all had two hits to lead the way. Faith Turinese allowed just one hit while striking out eight batters in five innings of work. Canton, 5 @ North Attleboro, 7 – Final – Canton dominated the first half and held a 2-0 lead but North was able to tie it up in the second half and scored two late goals to earn the win. “Our defense played well and our young middies stepped up and got it done,” said North Attleboro head coach Kevin Young. “Hats off to Canton, I thought they outplayed us. Fortunately. our guys held it together and earned a scrappy win.” Dan Conroy scrapped his way to a ground ball and tied the game at 3-3 in the fourth. After Canton retook the lead, Damien Curtis tied it 5-5. Nick Ward scored the game-winner for the Rocketeers with 3:30 left and Tommy Lindstrom sealed the deal with an empty net with 1:30 to go. Attleboro, 0 @ North Attleboro, 5 – Final – North Attleboro’s three singles players combined to lose just one game total in a sweep over rival Attleboro. Richard Bermudez won 6-1, 6-0 at first singles while Christian Bermudez (second singles) and Jonah Manso (third singles) each won 6-0, 6-0. Senior Ben Pfeffer and junior Vikram Senthilakumaran won 6-1, 6-2 at first singles for North while sophomore Alex Pfeffer and freshman Sam Gallagher didn’t drop a game in a 6-0, 6-0 win at second doubles. Taunton, 3 @ Foxboro, 2 – Final – Taunton swept singles play to edge out Foxboro on the road. Senior Francois Hennaux battled to a three-set win (6-1, 1-6, 6-4) at first singles, Brett Beaulieu impressed in a 6-1, 6-1 decision at second singles, and Mike Brigg recorded a 6-4, 6-3 win at third singles for the Tigers. Franklin, 5 @ Canton, 0 – Final – Frankin notched an impressive win on the road, losing just seven games total to sweep Canton. Liam Marr (second singles), Saketh Saripalli (third singles), the team of Tyler DiPalma and Derek Wu (first doubles) and the pairing of Dan Angermeier and Tony Calderone (second doubles) all won 6-0, 6-0 for the Panthers. Franklin’s Rohan Herur battled to a 6-3, 6-4 win at first singles. King Philip, 5 vs. Walpole, 0 – Final – King Philip won all five matches in straight sets to get a sweep over visiting Walpole. Marco DiStefano picked up a 6-3, 6-2 win at first singles, Nick Putney notched a 6-2, 6-1 win at second singles and Jack Cannon won 6-1, 6-1 at third singles. KP’s pairing of Sean Desrochers and Nate Ihley won 6-1, 6-2 at first doubles while Aidan Ignatius and Nick Ihley recorded a 6-2, 6-4 decision at second doubles. Mansfield, 0 @ Sharon, 5 – Final – Sharon senior Fred Bondar prevailed with a 6-2, 6-4 win over Mansfield junior Luke Nickerson in a battle of two of the top players in the league. Andre Olivei earned a 6-0, 6-1 win at second singles and Danujan Thirumavalavan won 6-2, 6-2 at third singles for the Eagles. Sophomore Alberto Olivei and junior Max Brody won 6-4, 6-2 at first doubles while Arie Chinnappan and Russell Rapaport notched a 6-4, 6-2 decision at second doubles. North Attleboro, 5 @ Attleboro, 0 – Final – North Attleboro won all five matches in straight sets without dropping a game in three of them. North’s Jordan Willis (first singles), the team of Shurobhi Nandi and Azka Siddiq (first doubles) and the pairing of Leah Marceau and Tara Nair (second doubles) all won 6-0, 6-0. Senior Emily Chiasson won 6-1, 6-0 at second singles and classmate Katie Ovoian won 6-3, 6-2 at third singles for the Rocketeers. Canton, 5 @ Franklin, 0 – Final – Canton went on the road and earned a sweep of Franklin, taking all three singles matches in straight sets. Natalie Keppler (first singles) and Rachel Kupferman (second singles) each won 6-0, 6-0 while Sarah Hernandez earned a 6-1, 6-2 win at third singles for the Bulldogs. The team of Caitlin Matthews and Stelina Michaelidis prevailed 6-0, 4-6, 10-6 at first doubles and the pairing of Jamie Cree and Jena Moyle picked up a 6-2, 6-0 win at second doubles. Sharon, 5 @ Mansfield, 0 – Final – Sharon won all five matches in straight sets to record a win on the road at Mansfield. Lulu Yuan won 6-0, 6-1 at first singles, Emily Wen notched a 6-2, 6-2 win at second singles, and Katie Merport picked up a 6-0, 6-0 win at third singles. The team of Sophia Fein and Rithika Neti won 6-2, 7-5 at first singles for the Eagles and Lauren Glass and Makaila Cheung won 6-2, 6-2 at second doubles. Milford, 2 @ Oliver Ames, 3 – Final – Oliver Ames’ Maura Kiernan didn’t lose a single game at second singles and both of the Tigers’ doubles teams won to edge visiting Milford. The team of Kristin Bloumbas and Emily Yu won 6-1, 6-1 at first doubles while Olivia Groebe and Rachel Stryke paired together for a 6-3, 6-0 win at second doubles. Milford’s Julie Rabinowitz won 6-2, 6-0 at first singles and Olivia Marshall won 6-3, 6-2 at third singles for the Hawks. Sharon, 77 @ Canton, 59 – Final – For Canton, Cordel Smith was a triple winner after taking first in the long jump (21’5), high jump (5’11) and the 200M (22.4) while also adding a second place finish in the 100M (11.3). Shane Graham took first in the 400M (52.7), Colin Messinger crossed first in the 2 Mile (10:10.4) and the Bulldog 4×400 team (Gerry Sullivan, Zach Goldstein, Chris Milne, and Shane Graham) was first (3:44). Matt Floyd added a second place finish for Canton in the 400M hurdles (63.3). Oliver Ames, 74 @ Attleboro, 62 – Final – Oliver Ames’ Jack MacAdam was a triple winner, helping the Tigers edge Attleboro on the road. MacAdam took first in the 400M hurdles, the 110M hurdles, and the long jump to lead the Tigers. Other first place finishes for Oliver Ames included Jason Windvogel (1 Mile), Ethan Eckstrom (800M), Zane Reservitz (2 Mile), Ryan Tamasanis (high jump), Aaron MacDonald (triple jump), Anthony DeCosta (discus), Quinn Proudler (javelin), and Jack Mills (shot put). Franklin, 45 @ Mansfield, 91 – Final – Mansfield swept the 100M, 200M, and the long jump to earn nine points from each event to get a win over visiting Franklin. Greg Waters (11.3), Khristian Conner, and Colin Eutsay swept the 100M for the Hornets, Mike Shannon (22.6), Jack Rivard, and Dan Knight took first, second, and third (respectively) in the 200M, and Jareme DiLorenzo (19’8), Joe Cappelletti and Andrew Williams took care of placements in the long jump. Sharon, 110 @ Canton, 26 – Final – Canton’s Sarah Collins took first in the 800M (2:32) and placed second in the 400M hurdles (67.8) to pace the Bulldogs. Chloe Pennacchio was first in the 2 Mile (13:09.7), Bronwyn Mahoney was second in the shot put (30’2), Maddie Rousseau took second in the 200M (27.4) followed by Leah Murphy (27.9). Freshman Olivia Rodman was third in the 400M hurdles (70.4) and the triple jump (31’3) for the Bulldogs. Franklin, 78 @ Mansfield, 58 – Final – For Mansfield, Amanda Mangano had a terrific day with three wins and a second place in another event. Mangano won the 100M (12.4), the 200M (25.3), and the high jump (5′) while taking second in the long jump (16’6). Junior Julia Hill had a 7-inch PR in the long jump to win with a jump of 16’7 and running a three second PR in the 400 hurdles for a second place in a time of 69.4. The Hornets’ 4×100 team of Gabrielle Devlin, Emily Quitzau, Samantha Hindman, Julia Harrison had a season-best time of 50.4 while sophomore Lily Goulding took first in the javelin (95’4″). Sharon, 5 @ Attleboro, 13 – Final – Attleboro overcame a 4-1 deficit, scoring three runs in the fifth inning to tie it, two more in the sixth in the take a lead, and then seven runs in the final inning to put the game to bed. Attleboro senior Drew Pagano earned the win in relief, tossing 2.1 scoreless innings. James Weir went 2-for-4 with two stolen bases and two RBI, Troy Gamache had two hits and an RBI and Sam Larkin chipped in with two hits. Sophomore Alvaro Espinel drew five walks, stole three bases and scored three runs while senior Corey McKenna had a two-run double and three stolen bases. Foxboro, 3 @ Franklin, 0 – Final – Foxboro senior Steve McLaughlin tossed a complete game shutout, scatting three hits while striking out three to lead the Warriors to a win over Franklin. Chad Bearce (single) and JT Burke (double) each recorded an RBI as Foxboro scored single runs in each the first, second, and fourth innings. Anthony Mollica and Joe Cavaleri each had a hit for Foxboro. Franklin’s Jake Noviello struck out 11 batters in five innings of work with just two walks and no earned runs allowed. King Philip, 17 @ Canton, 4 – Final – King Philip’s offense exploded for 17 runs in its season opener to pick up a win on the road. Sophomore Robbie Jarest went 3-for-3 with an RBI while Jeremy Rhines had two hits, including a double, and an RBI. Rhines earned the win on the mound with five innings of work, striking out four batters without allowing an earned run. KP head coach Greg Kessler said Collin Cooke and Nolan Bradley had strong games defensively. Mansfield, 9 @ Stoughton, 1 – Final – Mansfield broke open a 1-1 game with two runs in the fifth and then added four more in the sixth, and two more in the seventh inning to turn a close game into a big win in both teams’ season opener. Hornets senior Tyler Dalton scattered four hits over four innings of work while striking out four to earn the win. Kevin Dow pitched three scoreless innings of relief. Offensively, Sam Nugent (RBI, run), Mike Hargadon (two RBI, run), Cullin Anastasia (RBI), Eric Longley (run), and Dow (two RBI, run) each had two hits for the Hornets. For Stoughton, Ruben Gonzalez, Mike Nazzaro and Will Eckhart each had a pair of hits. Eckhart allowed three earned runs in five innings of work while striking out four. Taunton, 5 @ Milford, 2 – Final – Taunton senior Tyler Medeiros allowed just four hits in five-plus innings of work, striking out seven with two runs allowed to earn the win. Taunton scored three runs in the top of the fourth to take a 3-1 lead, added another run in the fifth inning, and tacked on an insurance run in the top of the seventh. Josh Lajoie (save), Christian Simoes, and Jacob Crawford each had two hits for Taunton while Jack Moynihan had a two-RBI triple in the fourth inning. For Milford, Danny Corsini allowed just two earned runs in six innings of work with three strikeouts. Colby Pires (RBI) and Matt Shaver (walk, two runs) each had a pair of hits for the Hawks. Oliver Ames, 2 @ North Attleboro, 5 – Final – North Attleboro senior Nick Sinacola dazzled in his season debut, striking out 11 batters over six innings of work with five hits and two walks allowed. North scored single runs in the first, third, fourth, fifth and sixth. OA had a chance to tie the game with the bases loaded in the seventh inning but Peter Cohen came in to get the final out via strikeout. Nick Raneri went 2-for-3 with a double, Zach DeMattio went 2-for-3, and Nolan Buckley had a two-out RBI triple in the fifth for the Rocketeers. Oliver Ames senior Mitch Goulet was 1-for-3 with an RBI. Canton, 0 @ King Philip, 25 – Final (5 inn.) – King Philip’s Meghan Gorman had four of the Warriors 15 hits, including a two-run home run and a pair of doubles, finishing with five RBI. Brooke Taute contributed three hits, including a triple, and three RBI while Faith Turnese and Hailey McCasland each had multiple hits. Elise Pereira earned the win with a complete game, six strikeouts and just one hit allowed. Foxboro, 3 @ Franklin, 2 – Final – Chelsea Gibbons went 2-for-4 to lead the Warriors, while Hannah Davis and Jill Finn each had an RBI single in the victory. Foxboro’s Emma Rohan went the distance in the circle to get the win. Stoughton, 1 @ Mansfield, 10 – Final – Mansfield coach Lori Letendre called the opening game of the season “a great team effort,” as the Hornets got a strong start from Sarah Cahill, who allowed only three hits and struck out five, and had six players record at least two hits. Mady Bendanillo and Caty DeMassi both went 3-for-4 with DeMassi just a double away from the cycle. Sydney Woods, Felicity McMullin, Ella Verheggen, and Cahill each went 2-for-4. Every player in the Mansfield lineup had at least a hit or an RBI. Kerran Holmes also made a big play in left, turning a double play after a shoestring grab. Milford, 8 @ Taunton, 7 – Final – Click here for a recap and photo gallery of this game. Oliver Ames, 0 @ North Attleboro, 22 – Final (5 inn.) – Bella Erti struck out six and allowed only three hits in five innings of work, while also registering three hits at the plate. Ashley Cangiano led the offense, going 4-for-4 with a homer and five RBI. Abby Gallagher scored four runs, while Olivia Capobianco scored three times and had a stolen base and Annabelle Hebard and Katy Daby each had triples. All four finished the game with two hits apiece. Lexie Campbell, Kayla Georgeu, and Katie Mills each had a hit for Oliver Ames. Canton, 2 @ Foxboro, 13 – Final – Foxboro built a 7-0 lead by halftime and never looked back to earn a league win over division foe Canton. Louis Piccolo collected eight points – three goals and five assists – to pace the Warriors’ offense. Shayne Kerrigan went 15-for-17 at the face-off X and Bobby Yerardi chipped in with three goals. Sharon, 4 @ Franklin, 13 – Final – Franklin junior Jacob Alexander dominated the face-off X, winning 17 of 21 attempts to help give the Panthers the edge in possession. Eric Civetti paced the offense with six goals and assist while Zach Alexander, Jacob Alexander, Jake Davis and Nitin Chaudhury each scored once for the Panthers. Will Davis made five saves in net for Franklin. Mansfield @ Stoughton – Postponed to a date and time to be announced. Oliver Ames, 10 @ Milford, 8 – Final – Oliver Ames senior Eric LeBlanc had a hand in over half of the Tigers goals, helping his side earn its first win of the season. LeBlanc scored five goals and had one assist to pace the offense while Shane Kilkelly added two goals and three assists and Frankie Ireland finished with a goal and two assists. Milford freshman goalie Evan Hazard made 15 saves in net while Andrew Gallagher had a team-high five points with two goals and three assists. Mike Demko and Brendan White each scored a pair of goals while Chase Blanchette had a strong game defensively with six ground balls. North Attleboro, 16 @ Taunton, 0 – Final – North Attleboro had eight different goal scorers, as new coach Colleen Carchedi gets her first win on her Rocketeers debut. Kayla Moulin earned the shutout in net. Alana Tavares grabbed two draw controls for the Tigers, while Hannah Moniz and Rosemary McGrath each had three ground balls. King Philip, 17 @ Attleboro, 3 – Final KP had seven different scorers and improved to 2-0 on the season. Katie Crowther led the way for the Warriors with seven goals and two assists, while Caroline Klim chipped in with three goals and three assists. Alli Meehan and Olivia Tormey each added two goals and an assist, while Dana Truini, Victoria Tormey, and Ali Wilson each scored once in the win. Caroline Watson made eight saves for KP. Foxboro, 19 @ Canton, 0 – Final – Sophia DiCenso scored three goals and Caroline Boudreau recorded four assists, as Foxboro used 13 different goal scorers to get the division win. Sara Addeche picked up the shutout in goal. Franklin, 18 @ Sharon, 5 – Final – Franklin junior Annie Walsh and sophomore Erin Walsh combined for 15 points to lead the Panthers to a win on the road at Sharon. Annie had seven goals and two assists while Erin finished with four goals and two assists. Katie Jones added two goals and two assists while Nicole Houlihan had two goals and Corinne Lewis had a strong game defensively with two ground balls. Gianna Cameron made seven saves in the win while Kate Morse made her season debut after suffering an ACL injury this past Fall. Sabrina Robbins scored a pair of goals, grabbed four draw controls, and three ground balls, while Emma Eberhardt added a pair of goals and five draw controls for the Eagles. Sharon also got a goal and an assist from Lydia Chase and 13 saves from goalie Rose Wald. Milford, 6 @ Oliver Ames, 16 – Final – Oliver Ames’ Chloe Kilkelly and Olivia Piazza combined for seven goals and six assists to lead the Tigers to a win. Sharon, 5 @ Attleboro, 0 – Final – It was a clean sweep for Sharon with all five matches ending in straight sets. Fred Bondar won 6-2, 6-2 at first singles, Danujan Thirumavalavan, won 6-1, 6-1 at second singles and Ashwin Sreevatsa won 6-0, 6-1 at third singles for the Eagles. The team of Max Brody and Russell Rapaport earned a 6-2, 6-0 decision at first doubles while Arie Chinnappan and Alex Aspel won 6-1, 6-2 at second doubles. Canton, 0 @ King Philip, 5 – Final – King Philip’s Marco DiStefano rallied after losing the first game to win the second and take a third set tiebreaker to complete the Warriors sweep. DiStefano won 2-6, 7-6 (5), 10-7 while Nick Putney (6-2, 3-6, 6-1) also went three sets at second singles. Jack Cannon won 6-1, 6-1 at third singles, Aidan Ignatius and Nick Ihley won 6-0, 6-1 at first doubles and Sean Desrochers and Nate Ihley didn’t lose a single game (6-0, 6-0) at second doubles. Foxboro, 1 @ Franklin, 4 – Final – Franklin swept singles play and took another win at first doubles to beat Foxboro. Rohan Herur (6-1, 6-3), Liam Marr (6-0, 6-1) and Tony Calderone (6-4, 6-3) took care of business in singles action while Tyler DiPalma and Derek Wu rallied from one set down to earn a 3-6, 6-2, 6-3 win. Foxboro’s team of Justin Neale and Brady Gardner earned a 6-3, 3-6, 6-3 win at second doubles. Stoughton, 1 @ Mansfield, 4 – Final – The Hornets picked up a pair of wins in singles as well as doubles to defend home court against Stoughton. Luke Nickerson won 6-0, 6-1 at first singles and Peter Lally earned a 6-1, 6-0 decision at third singles. The team of Jalaj Singh and Danny Radev notched a 6-0, 6-0 win at first singles while Ben Salden and Yash Sakitarkar won by the same score at second doubles. Stoughton’s Erik Anderson won 6-4, 6-4 at second singles. Milford, 0 @ Taunton, 5 – Final – Taunton’s Mike Briggs (third singles) and Alex Pugh and Trevor Hart (second doubles) each won in straight sets without dropping a game to pace the Tigers. Francois Hennaux won 6-0, 6-2 at first singles, Brett Beaulieu earned a 6-1, 6-0 at second singles and the team of Charlie Fiske and Dylan Kullas notched a 6-0, 6-2 win at first doubles. North Attleboro, 5 @ Oliver Ames, 0 – Final – North Attleboro won all five matches in straight sets without dropping a single game to record a win on the road. Richard Bermudez (first singles), Christian Bermudez (second singles) Jonah Manso (third singles), the team of Ben Pfeffer and Sam Gallagher (first doubles) and Alex Pfeffer and Alex Rinaldi (second doubles) all won 6-0, 6-0. Taunton, 4 @ Milford, 1 – Final – The Tigers notched a pair of wins in singles play and two more in doubles to take home a win from Milford. Vanessa Rosa won 6-1, 6-0 at second doubles and Jocelyn Pagliuca took a 6-2, 6-1 decision at third singles. The team of McKenzie Lurie and Sam Martin dropped just one game (6-0, 6-1) at first doubles and Amanda Pugh and Brianna Ferrier did the same (6-1, 6-0) in a win at second doubles. Milford’s Julie Rabinowitz won 6-3, 6-3 at first singles. Attleboro, 0 @ Sharon, 5 – Final – Sharon dropped a total of three games in singles action and two total in doubles play in a sweep over Attleboro. Nupur Shukla won 6-0, 6-1 at first singles, Lulu Yuan didn’t lose a game (6-0, 6-0) at second singles and Emily Wen earned a 6-1, 6-1 win at third singles. The team of Katie Merport and Sophia Fein earned a 6-2, 6-0 win at first doubles while Rithika Neti and Lauren Glass didn’t lose a game in a 6-0, 6-0 win at second doubles. King Philip, 5 @ Canton, 0 – Final – King Philip won all five matches but some were closer than the score indicates. Erin Regnier won 6-0, 7-5 at first singles, Meghan Sepich earned a 6-1, 6-4 victory at second singles and Caitlin Gonser walked away with a 6-0, 6-1 win at third singles. The team of Grace Ely and Mia Valencia squeaked out a win at first doubles (5-7, 6-4, 10-8) while Katarina and Schneider and Lucy Barnard dropped just two games in a 6-0, 6-2 win at second doubles. Franklin, 0 @ Foxboro, 5 – Final – Foxboro won three matches without losing a single game in a sweep at home over Franklin. Sophia Prinos (first singles), Pam Nelson (third singles), and the team of Julia Muise and Sarah Prag (first doubles) each won their match 6-0, 6-0. Kayla Prag won 6-0, 6-3 at second singles for the Warriors and Olivia Dantona and Kendall Milender emerged victorious (6-2, 6-3) at second doubles. Mansfield, 5 @ Stoughton, 0 – Final – Mansfield opened its season with a win, winning all three singles matches in straight sets. Senior Sarah Doyle won 6-0, 6-2 at first singles, Elizabeth Elsner took a 6-0, 6-2 win at second singles and freshman Aryann Khosravani won 6-1, 6-3 at third singles. Junior Tessa Garufi and sophomore Samantha Sternberg won 6-3, 6-1 at first doubles while junior Hannah Podolske and senior Cindy Gu prevailed with a 6-3, 3-6, 10-7 win at second doubles. Oliver Ames, 2 @ North Attleboro, 3 – Final – North Attleboro edged out Oliver Ames with a pair of wins in singles play and one win in doubles. Jordan Willis had a convincing 6-1, 6-0 win at first singles, senior Katie Ovoian won 6-1, 6-4 at third singles and the team of seniors Leah Marceau and Shurobhi Nandi prevailed 6-4, 7-6 (7-0) at first doubles. For Oliver Ames, Tate Hadges won 3-6, 6-4, 6-4 at second singles and Olivia Groebe and Rachel Stryke notched a 4-6, 6-0, 6-2 win at second doubles. Taunton, 3 @ Brockton, 0 – Final – Taunton picked up a convincing win on the road behind a balanced attack. Malik Charles had a team-high eight kills while Alex Tavares (four blocks), Lens Esquil (three blocks), and Lance Law (four aces) all registered seven kills. Ricardo DaFonseca finished with 32 assists for the Tigers.